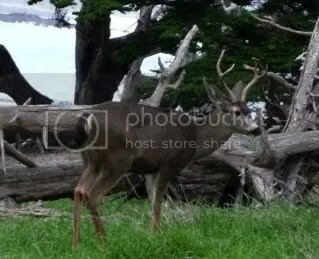 Since you last saw me, I’ve been to northern California and back. Monterey/Salinas area to be precise. The handful of times I’ve been there was with my ex-husband and while I loved that area, he had a tendency to cast a pallor of gloom over everything. A little advice right here? If you have a suspicion that you’ll love some place, don’t let someone who’s a weenie take you there. Or just avoid weenies. One of my friends from high school, Bridgett, lives up there and so it worked out that we were able to hang out with her quite a bit of the time, which was thoroughly enjoyable. The last time I saw her was in 2001 and we determined that nine years is far too long of a time between visits. She and her roommates were incredibly hospitable, generous and welcoming to us. 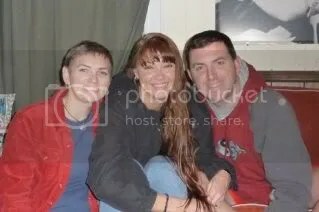 In fact, I’d never met her roommates before in my life, but felt as if I’d known them for years. I love people like that. Bridgett is a starving artist, or we can call her a cartoonist at large! She’s had creative artistic talent for as long as I can remember and I think high school art class is actually how we met. She did something with it, though, as far as college and schooling and education, and her comic strip recently made it into the local paper. I’m so proud of her. You should be, too, because I said so and also, because she was really tolerant and humble when I embarrassed her by making her autograph everything she gave me. 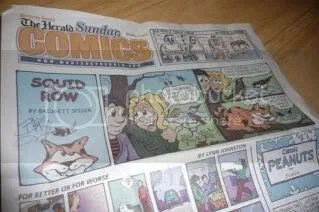 A copy of her cartoon on the front page of the Monterey Herald’s Sunday funnies? Please autograph. A piece of paper with directions? Please autograph. HAA! 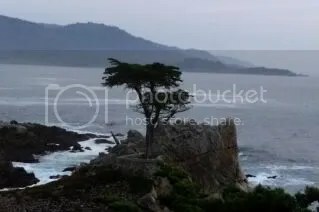 Besides visiting with her and touring her studio, or rather, her Cartoonery, other highlights while visiting the area included driving the 17 Mile Drive and ogling the breathtaking scenery, which included enormous waves colliding with immense power upon boulders and sheer cliffs, Bird Rock covered with so many sea lions that it looked as if, from a distance, it was covered with brown, wiggling worms, but we could hear them noisily expressing their opinions from shore, and in contrast, deer quietly standing alongside the road with green beards of grass dangling from their mouths as they quietly observed us taking their picture, and, of course, the Lone Cypress secured to the rock upon which it stands with cables, a stark silhouette against a gray sky, reminiscent of Charlie Brown’s Christmas tree when compared to the lush cypress trees nearby. 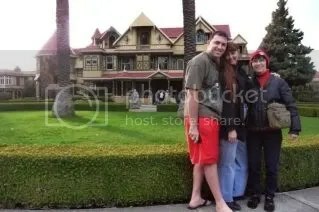 When we picked Tony up from the San Jose airport on Saturday, we visited the Winchester House. Truly, a spectacular experience. I took a ton of pictures, many of which were highly illegal (you know me and my pictures!). We did both the Mansion Tour and the Behind the Scenes Tour and they were equally entertaining, fascinating and informative. One thing, though, if you have kids who are under 5 years old, I would not recommend taking them on any tours of the mansion. Kids love stairs and, yes, there’s a whole lotta stairs. The problem occurs when you pull the child away from the stairs to stay with the tour, and you combine that with a tour time when your child would normally be napping. Can you say “meltdown?” One child with a non-stop, hour long, shrieking meltdown equals 25 unhappy tour guests. Ugh. The tour guide offered them a credit if they wanted to “take a tour at a later time” and suggested that they could “leave and join the tour at any time”… but the parents resolved to stay with the tour, for what purpose I have no idea. It’s not like they (or anyone else) could HEAR anything the guide was saying over the 100 decibel siren that was squirming in their arms. Common sense, people, common sense. We also went to the Steinbeck Center, which was a really educational and interactive experience. Since Salinas is a valley whose main history is rooted in agriculture and farming, and the cycle of same, and Steinbeck’s life was influenced by that, there was also a section in the museum showing the stages of crops and how they get from the fields to our kitchens. Another section in the museum was dedicated to the fine arts and local artists, however, we didn’t visit that part since Bridgett wasn’t featured in it! We could have spent much longer there, but we needed to head off to the airport… two hours is enough time to get a good feel for the place. 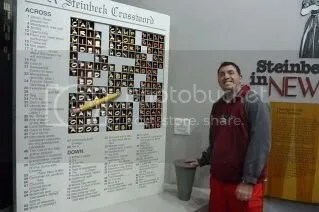 Oh but that all crossword puzzles could be solved just by pushing a button! 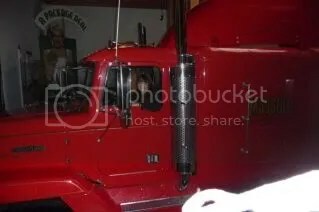 In the agriculture museum, I got to be a trucker! We had dinner out a couple of times, once in Salinas at a wonderful Italian restaurant and once at a restaurant on Fisherman’s Wharf in Monterey. Both restaurants were suggested, and dinner was generously gifted to us, by Bridgett and her roommates. I truly am blessed to have good friends. Sadly, we didn’t have time to go to the world-renowned Monterey Bay Aquarium (they have an octopus!!) because we departed Sunday afternoon, just before The Big Storm of California, January 2010, swept through the area. I’m currently listening to it beat down on the roof of my home and I’m so glad to be here and not out there in it traveling in a tin can through the sky. Soooo, what have you done since last Thursday? so, that’s where you’ve been!!! miss you! Let’s see, since Thursday I managed to read 5 chapters in a textbook, take (and pass) a quiz, made killer sauce from scratch (much to the delight of the family) and get out on my bike on a sunny day. Not as cool as your long weekend, but not too shabby. What a great trip Jammie…And such a fun visit with your friend. She is so talented. I so admire Cartoonists. It is a very special skill and the artistry of it is very obvious in her case. I wish her much much success! This rain storm today was really scary up here…The Wind….OY! Yes, it’s been a heck of a rain storm. Haven’t seen the likes of this kind of storm since I was in Nebraska in 2004. We don’t have weather like this out here! Stay safe up there on your hill! Smiles & Hugs Jammy…. can’t wait to do it again sometime…I have to introduce you to Gus (the octopus). -Brig. You have been missed! You must be so proud of your friend–they even have her ahead of “Peanuts” on the front page! Let’s see, since last Thursday, I’ve mostly been craving sleep. 🙂 I don’t remember much else of what I’ve done. I did take my little one to a restaurant yesterday (was meeting a friend) and dreaded being one of *those* parents who take their screaming kids to public places they shouldn’t be … but fortunately, Anne slept the whole time. Whew! Sounds like you’ve had a wonderful week, and are having a very happy life! To me, it’s not so much the taking kids where they shouldn’t be, I think kids can go most anywhere, so long as the parents use common sense when they get tired, whiny or start to cry (scream). Both of my SIL’s and my friend Grace seem to have mastered the art of handling their kids in public, I seriously cannot imagine them subjecting a group of 25 strangers to an hour long display of their child SCREAMING at the top of their lungs. It just wouldn’t happen. Does that make sense? Wow, you have been busy! 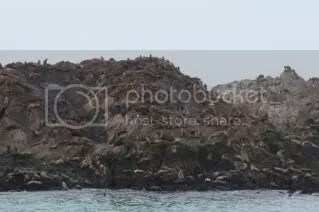 Looks like a fantastic trip especially the sea lions, how kewl was that?????? mostly staying dry. hope the forecast is right and the rain is done by tomorrow. i’m kinda sick of the rain!